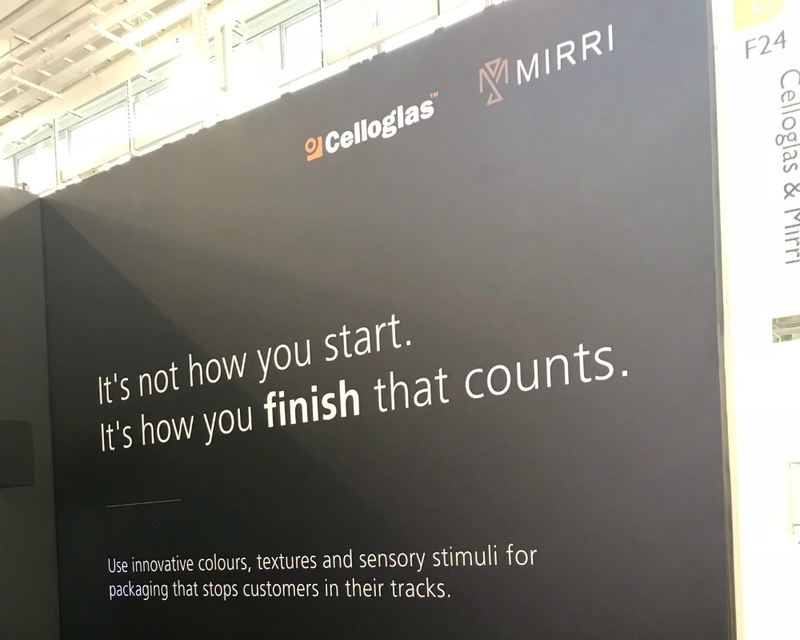 Last week, Celloglas and Mirri headed down to the hustle and bustle of London for Packaging Innovations 2018, the UK’s most renowned luxury packaging event. After months of planning, our stand, samples and staff members were ready for action. Our aim for this year’s event was to continue in our mission to demonstrate to people what you can really achieve with our products. Here, we discuss how the day went and what we took away from it. 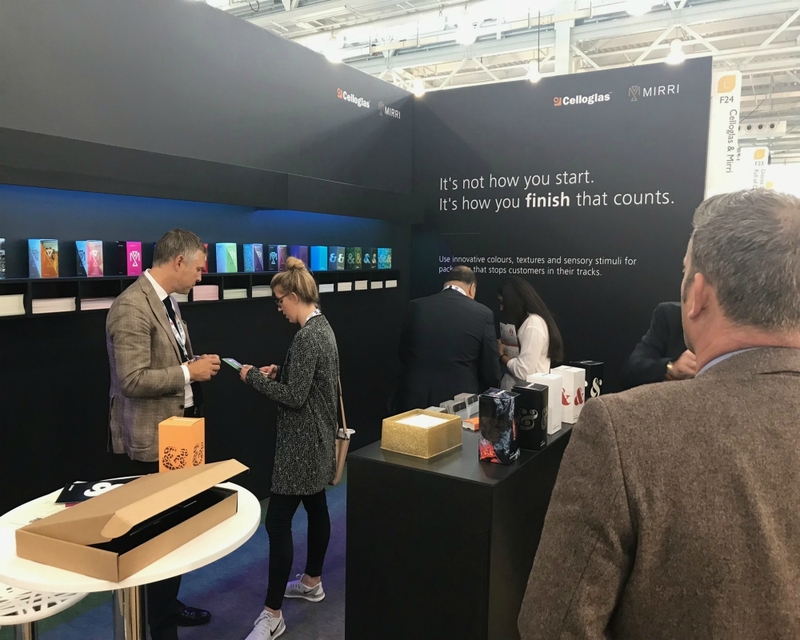 Following suit from previous years’ stands, we ensured the concept was interactive so people could get a ‘hands-on’ experience with the products we have on offer. We’ve introduced a wide range of new products to the market so it became a challenge in itself deciding how to best present their unique qualities and styles. The design for the space was based on showcasing the product and not necessarily ‘the stand’. 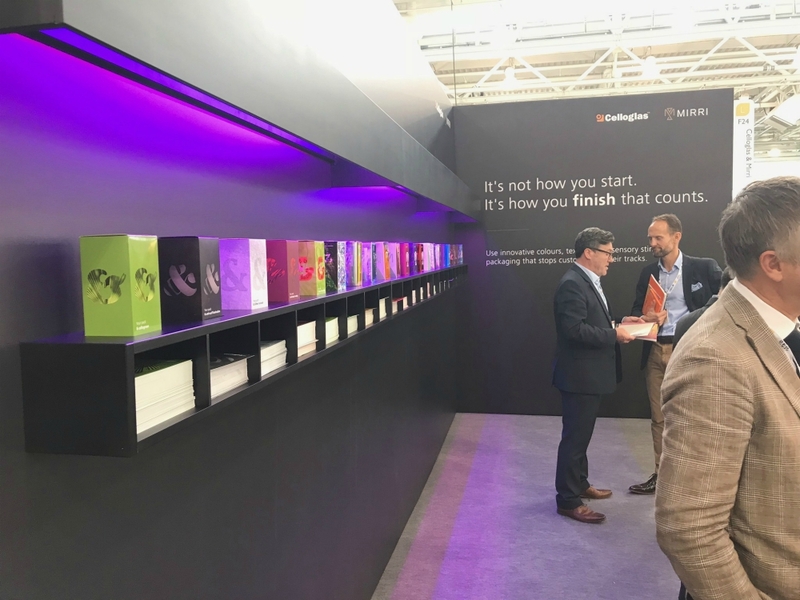 We opted for matt black surroundings and a simplistic one-tier shelving unit to allow people to easily see what types of products we were presenting. The built-in alternating LED lighting cast over the sample cartons showcased our highly reflective products. Mirri sparkle, for example, perfectly embodies luxury via your packaging. This year’s sample and carton designs were constructed through a lot of careful planning, testing, amending and collating of ideas across the board. We know we have something special – particularly in our Mirri range – and in order for printers and designers to really understand how they can harness its potential, seeing and feeling the products is key. Our samples now explain technical information on the reverse to inform the reader exactly how to design (layers/file set up) or print onto a range of our products. 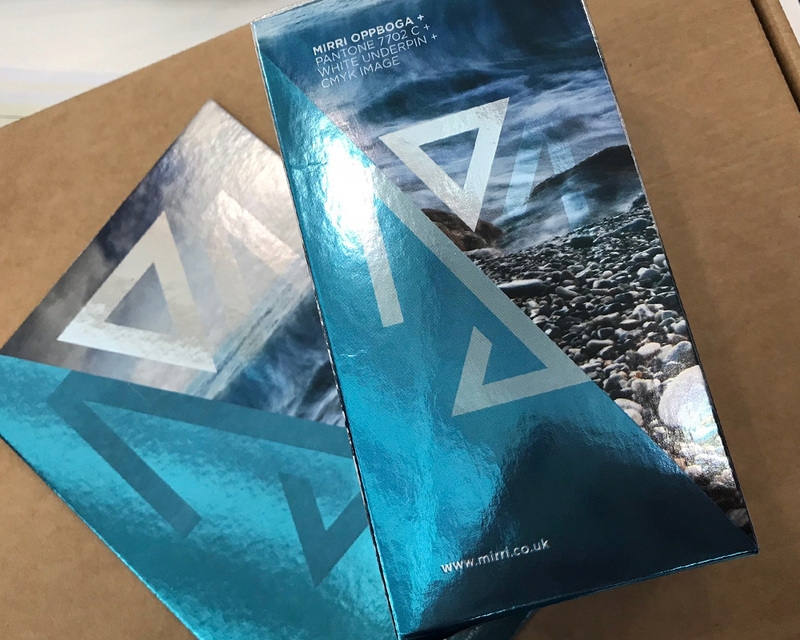 Our cartons – made specially for the event – were four-sided and showed the ‘process’ of blocking out the Mirri effect with a white layer in order to create visually effective print. We also showed how pantone colours look when printed directly onto the Mirri material. Some of our more popular and most talked about products on the day included cellogreen and Mirri sparkle and recent addition to the Mirri range, Mirri Oppboga (as seen above). We attended various seminars but paid particular attention to those discussing eco-friendly initiatives in packaging. Our heritage and brand ethics are steeped in innovative but sustainable and greener ways of working. Cellogreen and Mirri Eco AG are two products specifically developed with eco credentials in mind. We’re working hard, as is the industry, to help brands and retailers meet green targets and policies and limit their environmental impact. If you didn’t collect samples from the stand last week, you can order them now. Alternatively, if you’d like to book a consultation following discussions at the show, please feel free to get in touch.